Mobile phone operator Vodafone has declined to comment on a report that it is considering buying T-Mobile UK. The Financial Times reported that the company was interested in acquiring T-Mobile's UK operations, even though a deal may be blocked by regulators. Any such move would make Vodafone the biggest mobile operator in the UK, with a 40% market share. Vodafone has a 25% share of the UK market, behind O2. T-Mobile, owned by Deutsche Telekom, has a 15% share. Deutsche Telekom has appointed JP Morgan to advise on "strategic options", the newspaper said. Deutsche Telekom said it did not comment on market rumours. 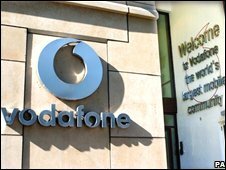 Shares in Vodafone ended the day up 1.2% at 117.60 pence. T-Mobile UK reported a 21% fall in sales in the first three months of the year. According to the FT, it has an estimated enterprise value of between 3bn euros and 4bn euros ($4.2bn-$5.6bn; £2.5bn-$3.4bn). A combined Vodafone/T-Mobile operation with a 40% UK market share in the UK would leapfrog the current UK market leader O2, which has a market share of about 27%. Although the creation of one company with 40% of the UK market would almost certainly lead to competition questions, such large operators already exist in France, Italy and Spain. Earlier this year, Vodafone chief executive Vittorio Colao said that his company was willing to play an active role in consolidation between operators. In February, Vodafone and Hutchison Whampoa, which owns mobile operator 3 in the UK, announced plans to merge their Australian mobile phone businesses. In May, Vodafone said it was accelerating the pace of its £1bn cost-cutting programme because of the impact of the economic downturn on sales. The company was forced to write off £5.9bn in the 12 months to the end of March - mostly related to its Spanish business - as its pre-tax profits fell 53.5% to £4.2bn from £9bn a year earlier. One analyst questioned why either side would be interested in a deal. Steven Harley, senior analyst with the mobile team at Ovum, said the timing seemed wrong. "From T-Mobile's perspective, why sell at the bottom of the market? You're not going to get top dollar," he said. "From Vodafone's perspective, why lay out a significant sum at a particularly bad time? Yes you'll buy the extra customers but you'll get the operational costs as well." Mr Harley also pointed out that T-Mobile has a network-sharing deal with 3, while Vodafone has a similar deal with O2. "How would 3 get compensated for this?" he asked. "If you've got three operators running off the same network the costs for them will be a lot lower than for a single operator running off one network."